Waterfiends are a monster famous for having an extremely high drop rate for Crimson Charm, which can in turn, be used for Summoning, and are currently the second-best source for charms in general. Along with that, they are assigned as a Slayer task by several different Slayer masters. They are level 115 and can hit up to 119 with their Magic based attack and Ranged attack. Therefore, there are some things you must know before your attempt to kill these monsters. Waterfiends are very strong against everything except crush attacks, so it is not recommended to use any weapon that does not have a 'crush' attack style. You will be very weak if you do not use crush. 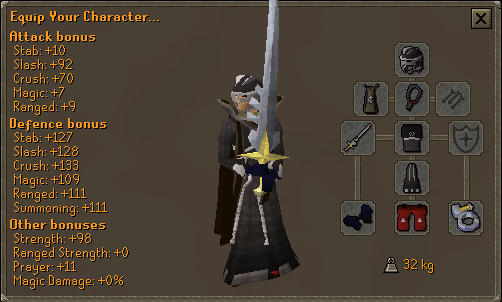 If you have a high defence level (90+), you should only need black dragonhide. If you can use Piety, you shouldn't need to use Protect Range, although it is your decision. If you have 68 Summoning, it is advised to bring a bunyip and several scrolls for said Bunyip. The bunyip heals 200 Life Points every 15 seconds, and the scrolls let you eat the raw sharks and other fish that the waterfiends drop. Unicorn Stallion scrolls heal you by a decent amount, although they require 88 Summoning. If bringing a familiar, take out two sharks and put in a bunyip/unicorn pouch and the scrolls. Warning: Make sure you do not summon the bunyip/unicorn until you get in the caves: Familiars cannot follow you through the whirlpool! Once you have all this, you're set to go kill some Waterfiends! 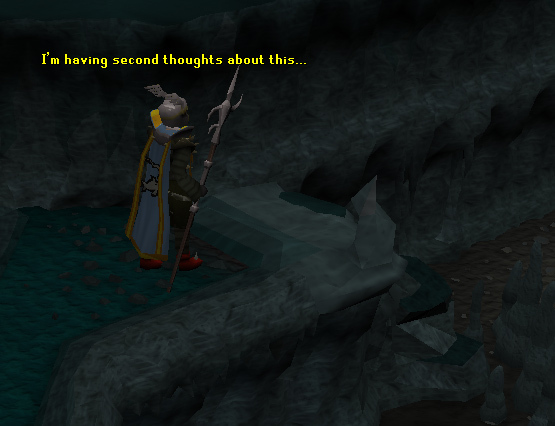 Waterfiends are located in the Ancient Caverns to the south of the Barbarian Outpost. The map shows where they are and a few methods to get to them. 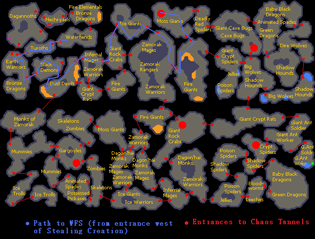 Although this method is not recommended, you can walk to the Ancient Caverns from Ardougne or Relleka. 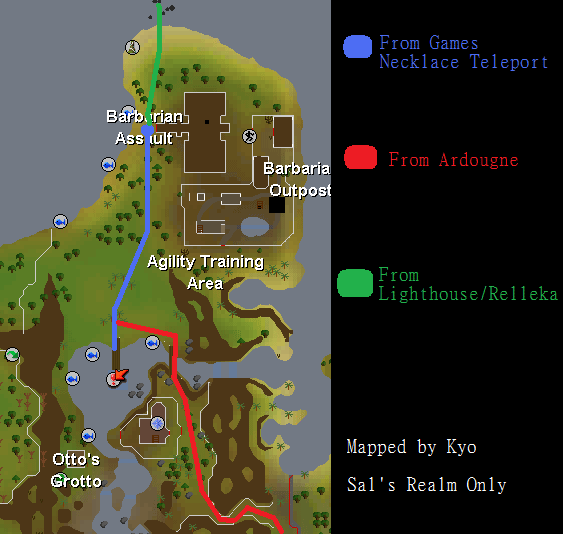 The best way to get there from Relleka is have your house in Relleka, then teleport there, go west to the Lighthouse, and go south across the stones. This is the easiest way to get to the Caverns. A Games Necklace can be bought for around 1,000 gp (at the time of writing, subject to change). 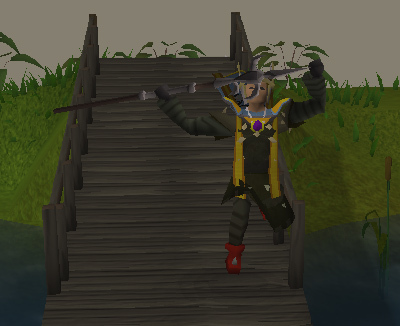 The 'Barbarian Outpost' teleport puts you right outside the entrance to Barbarian Assault. You can also use the Fairy Ring that is in the ancient caverns, although you need 5 Mushrooms and a spade to fix it. The code for this is BJQ. 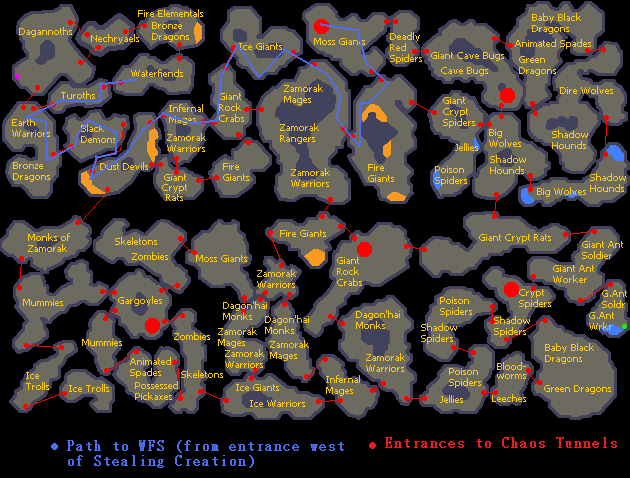 Note that waterfiends can also be found in the Chaos Tunnels and in the high level wilderness (after Temple at Senntisten quest), although it is highly recommended that you only go here after you are 130 Combat or higher, as these areas are multi-combat. You should also bring a high-level familiar (any titan, unicorn, wolpertinger or pack yak is recommended; any high level familiar in general), along with Karil's armor. Black dragonhide isn't recommended as this is a multi-combat area and the dragonhide will not offer enough of a magic bonus to do any good there. You should also have a high prayer level so you can use Soul Split or Turmoil. If you can't use either of these, just protect from range and Piety. 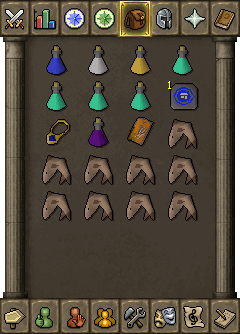 Teleport to the Barbarian Outpost to start, take a sip of your antifire potion and put the necklace and the potion in the Bank Deposit box in the outpost. Now run to the south, and there will be a dock with a whirlpool at the end. Jump into this whirlpool and you will be in the Ancient Caverns. You should now be at a staircase leading to the main floor. Before you go down this, make sure you set your attack style to 'Crush', put on your anti-dragon shield, and go down. You should now be in an area with Brutal Green Dragons. Run a bit to the west, just past the dragons, and you will find the Waterfiends! As soon as you get to them, turn on Protect from Missiles (Turmoil if using Ancient Curses), as the waterfiends will be aggressive. 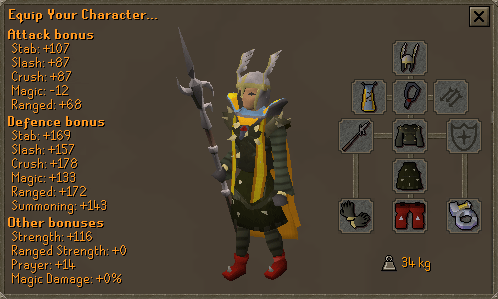 Drink your super set, take a sip of prayer potion when your level drops below 10, and eat every so often, and you should be set. Only take your prayer off when they stop being aggressive. Also, another warning. 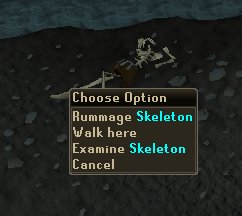 There will be a pile of bones on the ground with an option to rummage through them. DO NOT click this. Doing so will make an aggressive level 130+ barbarian skeleton attack you. Now for the drops. As said before, waterfiends are known for their high rate of dropping crimson charms. Therefore they are targeted by players wishing to train Summoning quickly. With no familiar, it is expected to gain around 25-35 charms per trip. With a familiar, it will be a lot higher (depending on your stats). They also drop noted water orbs, which will sell for a decent amount of cash. They always drop one water rune, although if you see a drop with Water Runes and Charms with nothing else, there will be an extra 90 runes, totaling to 91 Water runes. 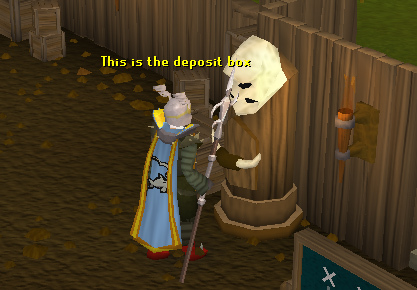 Generally, if using a familiar, you will be able to break even with the cash you spent on prayer potions/food. Once you run out of prayer potions, it is recommended that you teleport out, restock, and come back. I hope this guide helped you out, good luck with killing the waterfiends.